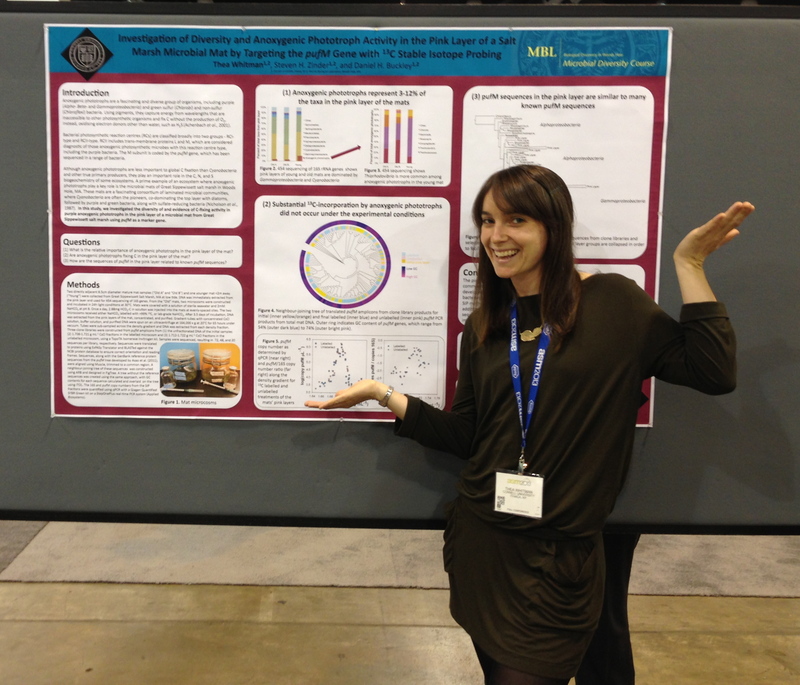 I just left the last session of my first full day at the 2013 American Society of Microbiology conference. It’s been very interesting thus far. I presented my poster on my Woods Hole MBL research this morning. It went really well – lots of people came by my poster, some drawn by stable isotope probing, some by the anoxygenic phototrophs, and some by microbial mats. It was fun to talk about my research to people coming from different perspectives. That’s one of the ways posters are better than talks: you can tailor their content to the individual. I was psyched to meet a researcher from the Pacific Northwest National Lab, where I applied to do some nanoSIMS analysis this fall (still waiting on the proposal). There was a nice opening session on ‘omics – i.e., metagenomics, proteomics, transcriptomics, etc., where Dave Stahl presented his lab’s work on evolution in simple syntrophic systems, and Nicole Dublier discussed her lab‘s research on marine worm symbionts, along with some other really great researchers. The most thought-provoking session for me was the Citizen Science + Microbiology session. There are some crazy projects going on: uBiome, the American Gut Project, and yourwildlife.org, not to mention scistarter.org, which you can search to get involved in citizen science projects. That term – citizen science – has been tossed around a lot at this conference, and I’ve been thinking about what it really means. Projects that widely sample (often human) microbiomes – we’re talking hundreds of people, sometimes with hundreds of samples per person, collected by the person themselves – often refer to the work as “citizen science”, but I’m not sure if this is quite the right term. It’s definitely science ON citizens, or science WITH citizens, but it’s not necessarily science BY citizens, which is what I think of when I think of the term “citizen science”. That’s not to say it’s not valuable work – engaging people with really exciting science is always a good thing, and people love learning more about ourselves (and our zillions of little friends). I think every project that was presented delivered their findings to the participants, so the people involved definitely aren’t just sample sites. However, being a scientist is more than just taking samples. How can we support non-scientists in asking questions and formulating hypotheses, or figuring out what a good “control” is? The uBiome project explicitly discussed moving toward letting the general public ask their own questions. I chatted with Jessica Richman after her talk, and it sounds like they are planning to open their datasets to the general public to some extent, letting people propose studies or questions, and then supporting the design of those studies. I’m also intrigued by the (frightening?) idea that their $99 microbiome sampling services might result in people experimenting on themselves – for example, submitting their own gut samples under diets with or without gluten. In an academic setting, this would never happen without IRB approval! This was discussed briefly in the session, and there are some major major issues with that idea – these services provide people with the data and some degree of interpretation (what does your sample look like vs. others in the database? ), but can they provide them with enough support to interpret their findings appropriately? What if people make major health-impacting changes to their lifestyles based on these results? It’s an unprecedented level of access to information about ourselves, and it’s a unique challenge to make sure that an appropriate level of interpretive support is provided. I’m excited to see how these resources continue to be developed, and am sure it will remain a priority.